Rabbi Lawrence Hajioff serves on the Judaic studies faculty of Stern College for Women. 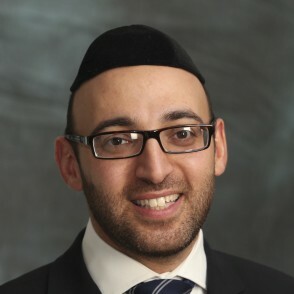 Originally from London, England, Rabbi Hajioff graduated with honors in political science from Manchester University. After working for two years for MTV in news production, and winning the national competition ‘Jewish Stand-Up Comedian’ of the Year, Rabbi Hajioff traveled to study in Israel and then Monsey to receive his rabbinical smicha ordination from Yeshiva Ohr Somayach. Rabbi Hajioff has worked extensively with young Jewish drug addicts, and in 2004 received an award from the Town of Ramapo for his work on their behalf. In 2005 Rabbi Hajioff joined the faculty of Stern College for Women at Yeshiva University. In 2006 he received the “Professor of the Year” award in Judaic Studies from the senior year students at Stern. Rabbi Hajioff also works for Birthright Israel in New York as their official Rabbi and educational director. He has been instrumental in implementing programs for Birthright Israel in Manhattan such as the very successful adult bar and bat mitzvah program which some four hundred people have completed so far. He also leads trips to Israel and Poland three times annually for some three hundred participants. Rabbi Hajioff also teaches on the Mechina Introductory Judaic studies program at Stern College. This program includes Shabbatonim on and off campus, and a summer learning program in Israel at the YU campus. He teaches introductory Judaic studies courses, which cover all the foundations of Jewish thought, as well as a lower intermediate level course covering all the Jewish holidays, and an intermediate level course on the Sabbath. He has developed a new course introducing kabbalistic ideas in Jewish thought. Children – Planting and Building; Bringing up Healthy Children in Today’s Technological World. Israel – Whose Land Is It Anyway?